White paper on crime 2004 Part5/Chapter3/Section3/6. As mentioned in Section2-4 in this chapter,stimulant drug prisoners started to increase in around1975,and at present they account for about one-fifth of newly admitted prisoners and about one-quarter of all prisoners in prisons at the end of each year.Most of them seem to be end users.Their reimprisonment rate is higher than other prisoners(see Table 5-3-2-39 ).In particular,they are highly likely to recommit offenses within three years after their release(see Fig. 5-3-2-41 ).Therefore,one of the current challenges is how to prevent them from repeating offenses in this period. At present,stimulant drug prisoners are engaged in prison work and participate in education programs for preventing stimulant drug abuse,such as lectures,group work,counseling etc.The New Five-year Strategy to Prevent Drug Abuse(Anti-Drug Abuse Headquarters,July2003)refers to the necessity of improving the education programs in correctional institutions,and the Recommendation of the Council on Prison Administration Reform(December2003)also suggests that the treatment of drug addicts should be reviewed from the viewpoint of criminal policy. The following will explain the current efforts of the Correction Bureau,the Ministry of Justice,in response to these recommendations,and introduce how drug addicts are treated in some Asian countries which have also faced problems of drug abuse. The New Five-year Strategy to Prevent Drug Abuse provides that,"(Correctional institutions)should support care and rehabilitation of drug addicts and drug abusers,and should make drug re-abuse prevention programs more effective.For that purpose they should make further efforts to enhance staff's teaching skills,to develop new teaching materials,and to promote utilization of sources in the private sector.At the same time,they should review the cooperation with private organizations as a part of support for prisoners'rehabilitation into society. "The Recommendation of the Council on Prison Administration Reform also suggests that,"Current treatment measures should be reviewed from the viewpoint of criminal policy focusing on the characteristics of drug offenders,and new treatment that can curtail the rate of reimprisonment should be pursued. "In response to them,the Correction Bureau of the Ministry of Justice held the Workshop for the Treatment of Drug Offend ers from April to June2004with the participation of medical institutes for drug addicts and private self-help organizations supporting drug addicts for their recovery from drug addiction.The workshop reviewed the treatment measures for drug prisoners including education programs preventing drug abuse and examined effective ways to further enhance them. The Correction Bureau plans to start a"Support Program Recovery from Drug Abuse(tentative name)"in correctional institutions,and is drawing up the program based on the opinions presented in the Workshop. In cooperation with the United Nations Asia and Far East Institute for the Prevention of Crime and the Treatment of Offenders(UNAFEI),the Research and Training Institute of the Ministry of Justice conducted a survey on"trends in drug abuse and effective treatment measures of drug abusers in the Asian region"for the period from2003to2004.Based on its results,the following explains the legal restrictions on drug abuse and compulsory treatment systems for drug abusers in Hong Kong,South Korea,Malaysia,Singapore,and Thailand. 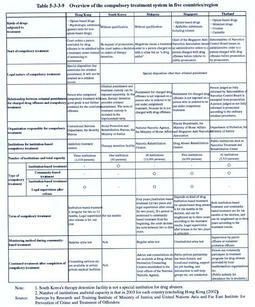 The effects of these measures cannot be judged without accumulative empirical studies,and the ways to tackle drug abuse vary according to each country's social,cultural,political backgrounds and kinds of abused drugs.Although a simple comparison between countermeasures in those countries and those in Japan cannot be significant,they may serve as a reference in searching for effective treatment measures to prevent drug offenders from committing repeat offenses. The major abused drugs in Hong Kong and in Malaysia are opium-based drugs such as heroin,morphine etc.,while those in South Korea and Thailand are stimulant drugs.In Singapore,abuse of synthetic narcotic drugs(stimulant drugs,ecstasy etc. )has increased significantly in the last five years,exceeding abuse of opium-based drugs since2003and becoming the mainstream. All five countries or regions have imposed harsh punishment including death penalty for the supply of controlled drugs in trafficking,production etc. For example,in Hong Kong,the harshest statutory penalty for production and illicit trade of dangerous drugs is life imprisonment,while in Singapore,the harshest punishment for unauthorized trading of heroin,stimulant drugs,and cocaine is the death penalty and the only statutory penalty for unauthorized production of those drugs is the death penalty.In Malaysia,the death penalty is the statutory penalty for illicit trade of dangerous drugs,and if someone possesses more than a certain amount of dangerous drugs(15grams of heroin or morphine,200grams of cannabis or cannabis resin,50grams of stimulant drug),he/she is considered to be involved in illicit trade.Also in Thailand,there is no statutory penalty other than the death penalty for production or trade of Class-A drugs such as heroin and stimulant drug etc.for selling.The statutory penalty for selling or possession of over20grams of Class-A drugs is the death penalty or life imprisonment. The countries or regions have adopted extremely harsh punishment on sale of controlled drugs,while medical treatment and educational programs rather than punishment are imposed compulsorily on drug abusers,particularly those who do not have a long history of drug abuse. The use of drugs is considered a crime in all five countries or regions,but at the stage of investigation or a court trial,eligible drug abusers are selected and have compulsory treatment imposed on them by orders of administrative bodies or courts.The compulsory treatment system refers to the system of imposing on a person,irrespective of his/her will,special treatment for dispelling drug addiction in an institution or in community. Table 5-3-3-9 shows an overview of compulsory treatment systems in five countries/regions.Except in South Korea,persons subject to compulsory treatment are removed from criminal procedures and are not punished for drug offenses in principle. The compulsory treatment systems have variations such as institution-based one,community-based one,and their combination.They aim at providing treatment to prompt drug abusers to get rid of drugs and reform themselves,utilizing various ways such as medical services(physical checkups,detoxification treatment etc. ),psychological intervention including counseling,occupational therapy,and vocational training etc.In Hong Kong,Malaysia,and Singapore,those treated in institutions are put under legal supervision(community-based treatment)for a certain period after release,and their treatment effects are monitored through urine tests etc.In Hong Kong,Malaysia,Singapore,and Thailand,the term of a community-based treatment,including a community-based treatment without an institutional one combined,is sufficiently long,from six months to three years,and after the completion of compulsory treatment,continued care is prepared by public or private bodies. The target drug abusers of compulsory treatment vary according to the country or region.In legal interpretation in Singapore and in operation in Malaysia,those drug abusers who have been imposed compulsory treatment more than twice are excluded and are punished for an offense of cumulative drug abuse even though they are end users.In Thailand,compulsory treatment is legally permitted only once.In Hong Kong,the court decision on whether to order the admission to a drug addiction treatment center depends partly on whether the person has ever been imposed compulsory treatment or not.Thus,in these countries,compulsory treatment is limited in principle for those drug abusers who do not have long histories of drug abuse,and repeated drug abusers are subjected to criminal punishment.